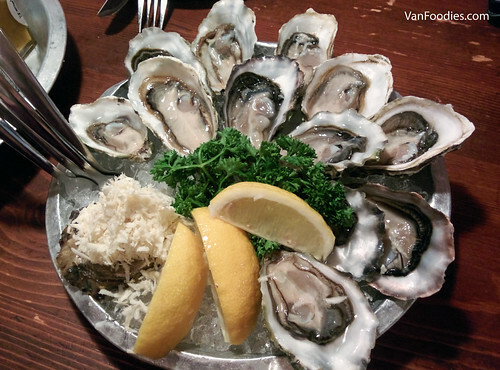 Have you checked out the Dine Out Vancouver website yet? Are you doing any prix fixe dinner? I was invited to a tour on the Granville Island to visit some restaurants for their menu preview. First up, Dockside Restaurant at the Granville Island Hotel. Dockside has been around for a long time. I remember going there for the first time for Dine Out back in 2008, then Christmas brunch with family in 2013, my bridal shower in 2015, then here we are again for Dine Out. Food quality was always solid and we always had a good time. There are three options for appetizer. First, the Winter Green Salad was so pleasing on the eyes. It’s colourful, with a good variety of vegetables. 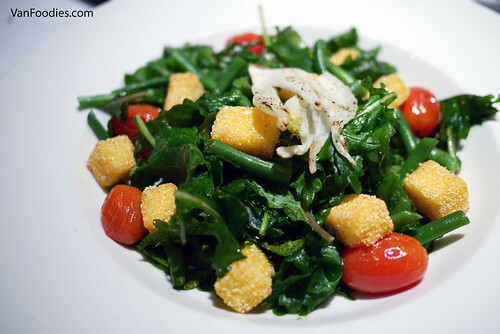 I like that it uses polenta as croutons; not only does it give a crispy texture, but also creamy, cheesy flavours. 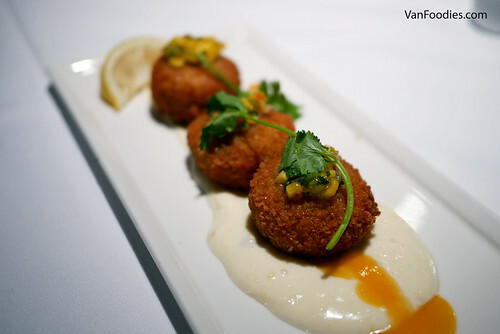 My friend JX loves her crab cakes, and I think she’ll enjoy these Dockside Crab and Shrimp Cakes. Perfect two-bite size, crispy on the outside and meaty inside. Not much filler there. The sweetness of mango salsa and creamy aioli balanced it really nicely. Taste of Yaletown is back! For the 12th year, 31 restaurants in the Yaletown area are each offering a special menu at $25, $35 or $45. Running from Oct 13 to Oct 27, this event has a “Sharing and Pairing” theme this year. Some menus are created grazing, share-plate style, allowing diners to to share with each other while pairing the food with wine, beer or a cocktail; and with smaller portions it would allow diners to even plan a restaurant hopping experience around the neighbourhood. As part of the media preview, a number of us were whisked away to one of the participating restaurants. I was lucky enough to sample the menu at Provence Marinaside. It’s been awhile since I last ate there, so I’m glad to go back for a re-visit. 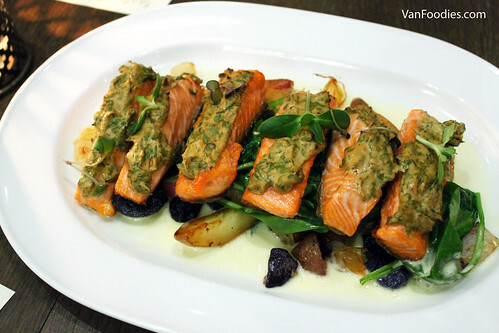 Provence’s Taste of Yaletown menu is $45. To start, you would receive a Provence Tasting Plate. 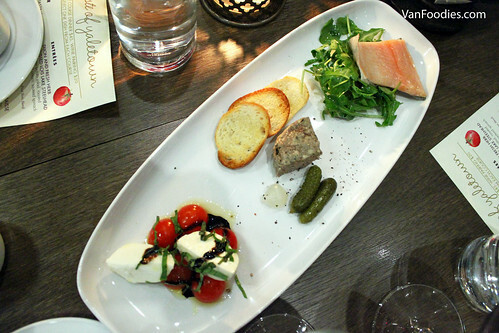 It includes 1) Tomato and Bocconcini Salad; 2) Rustic Country Style Pate; and 3) House Smoked Ruby Red Trout. You can’t go wrong with the classic tomato and bocconcini combination, and the basil added a herbaceous note. The pate was rich and flavourful; the meat had a nice, chunky texture. My favourite, and it’s a close call, was the smoked trout. It was flaky, lightly smoked, and for me it wasn’t fishy at all. I may have a favourite, but honestly I would eat any of the three appies again. And the good news is, you get all three! For entree, you have three options. We were able to try all three – but the pictures below are not actual portion size so I’ll try to help you visualize the actual portion as best as I can. The Dijon and Fresh Herb Crusted Lois Lake Steelhead had a nice crispy skin, and the meat was moist and flaky. I personally found the dijon mustard to be a bit overpowering. The beurre blanc was creamy, perfect pairing for the salmon; the warm potato salad was pleasant on the eyes, and on the palate. The actual portion should be about two pieces of salmon on our tasting plate. CC bought a Travelzoo voucher to a 6-course tasting menu at Bauhaus Restaurant and invited me to join her. Since its opening I’ve been wanting to try Bauhaus, and find out what German fine dining could be like, and now is my chance. 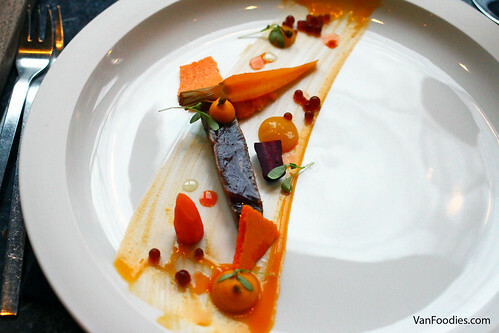 The Chef’s Tasting Menu changes seasonally, and when we went, they just launched a new one. Before we got into the six courses. 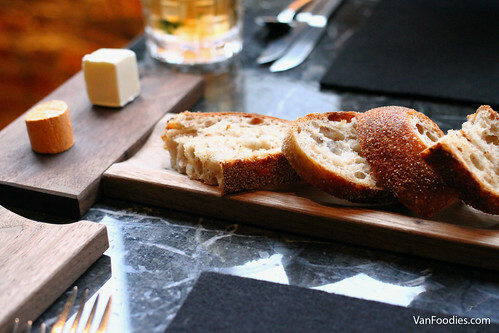 We were first greeted with some Bread, served with whipped butter with sea salt or butter with paprika. 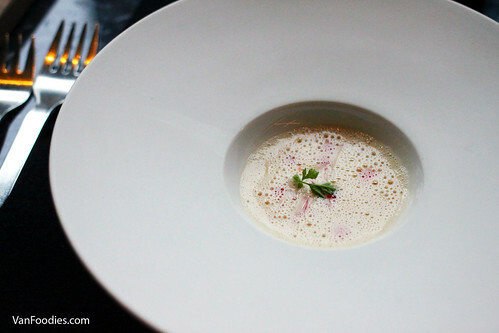 We also received an amuse bouche, which was a White Bean Veloute. It was light, with a hint of smokiness from the drizzle of paprika oil. There’s some horseradish foam at the top but I didn’t get the pungent peppery flavour of horseradish. It was just the right few spoonfuls of veloute to whet the appetite. First course was Tuna, soy marinated Yellowfin tuna. It’s an Asian-inspired flavour profile. The fish was lightly seared on the outside; the flesh texture was nice and firm, and the marinate wasn’t too overpowering. The salt in soy was balanced by the sweet orange carrot meringue and slightly tart orange gel. The presentation of this plate was stunning, loved the colour, but there were a lot of components on the plate and I wasn’t too sure how to approach it. Our friends at ChineseBites invited me to a Chinese fine dining experience at Chang’An Restaurant. 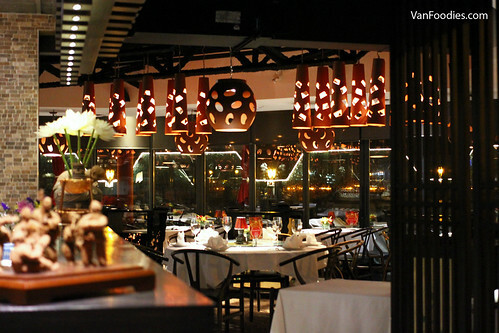 It’s located right under the Granville Bridge, where Nu and Stonegrill used to be, with the gorgeous view of the False Creek. It turned out to be an elaborate 17-course dinner. Hold the drool! This is going to be a long and delicious post! 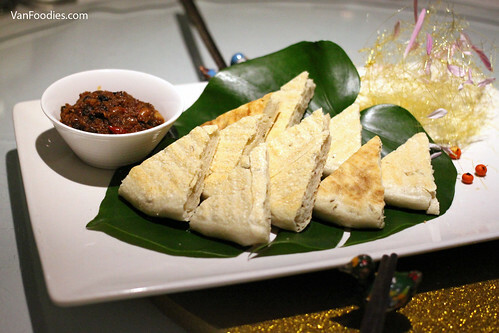 As each table of guests is seated, they would be greeted with Guo Kui Pita 鍋盔. This was like complimentary bread served at western restaurants. The pita bread was served warm, crispy on the outside, and soft inside. I really liked the fermented bean sauce that came with it; it’s nutty and spicy, kinda like XO sauce too. But we were all distracted by what’s happening on the table-side. 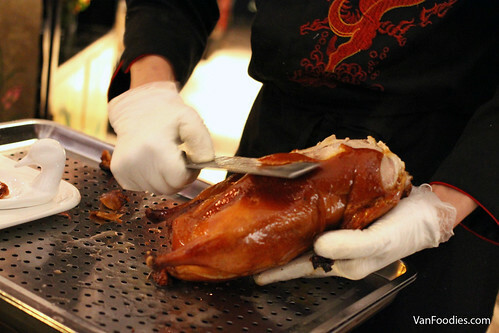 It’s the Chang’an Roasted Duck 長安炙鴨! This was what we came here for. It’s the restaurant’s signature dish, and you must pre-order ahead of time. Why? Because it takes 72 hours to prepare the duck, then it’s roasted in-house for over an hour. According to the restaurant, they actually schedule the cooking time based on your dinner reservation, so it would be served roughly 15 minutes after you are seated, ensuring the optimal tenderness of the meat and crispiness of the skin. 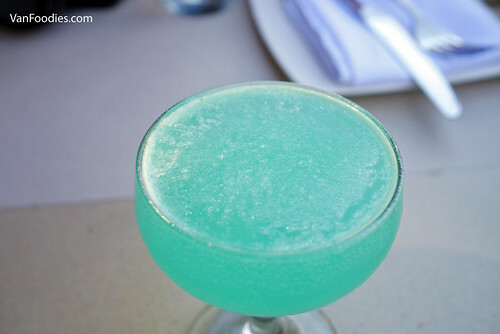 #SpringFling at Mosaic Grille & Bar – It’s an Eye Candy too! 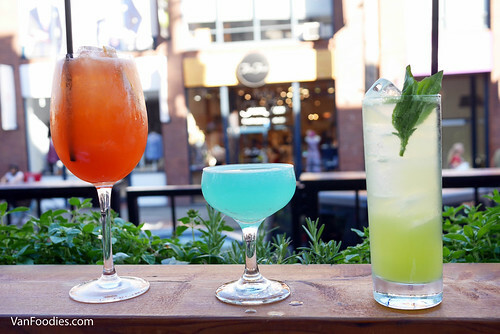 Partnering once again with the team at VANEATS, we were invited to sample the #SpringFling package at Mosaic Grille & Bar at the Hyatt Regency Vancouver. I haven’t been back since the Taiwanese-inspired dinner with former Executive Chef Thomas Heinrich, so I was quite excited to try their new offering. The $27 package comes with 1 appetizer, 1 entree and 1 dessert. We sampled the entire menu, so we can give you some insight as to what you should pick. The first appy choice was the Earth Apple Farms Mixed Kale. What a pretty plate! 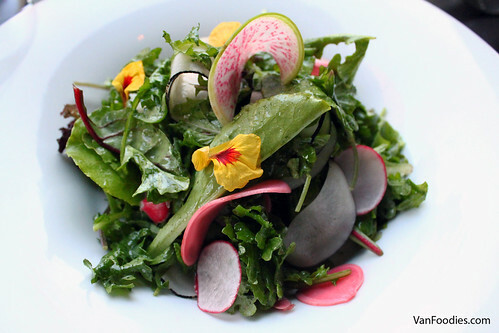 There was fresh and pickled radish and edible flowers, and a good mix of greens including baby kale. It’s refreshing with a good combination of texture, and the salad dressing had a good amount of acidity. It may be a salad but it wasn’t a boring plate. 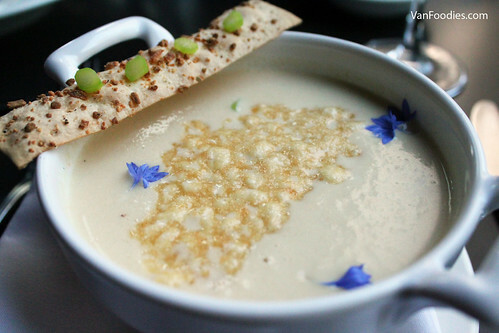 The White Asparagus Bisque reminded us of a cauliflower soup. Mr. liked the fact that it’s not fully strained so it still had some grainy texture. It had a hint of sweetness, it’s creamy and rich. The parmesan lavash was a good idea to add a crunchy element, but I personally prefer just a hearty slice of baguette. Even though I work in downtown Vancouver, I don’t usually get to enjoy Happy Hour. Generally runs 3-6pm, by the time I get off work, and I don’t leave work right at 5pm on the dot, it would be near the tail-end of Happy Hour or worse, I would miss it completely. Luckily for me, Rodney’s Oyster House offers its Happy Hour menu on Saturday, and my girlfriends and I checked it out as part of a birthday celebration. With the 4 of us, we went through most of its Low Tide (aka Happy Hour) menu. First, we ordered a dozen of Raw Oysters to start. They were $1.50 each Fanny Bay oysters. The sizes were pretty consistent, maybe with a couple that were slightly smaller. The taste was light and crisp, not creamy. We ordered another half-dozen afterwards. 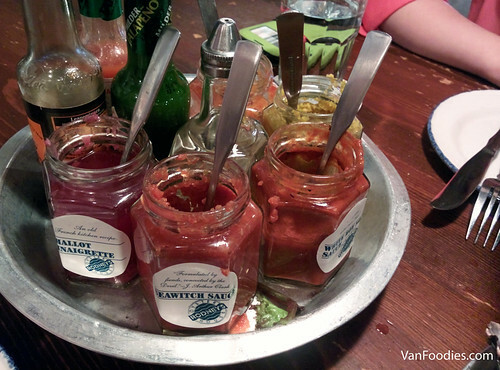 The Raw Oysters came with a number of sauces, from mild to super hot, and it was quite fun to test our spice tolerance. Turns out I didn’t do so bad; I think I got to the 4th jar!